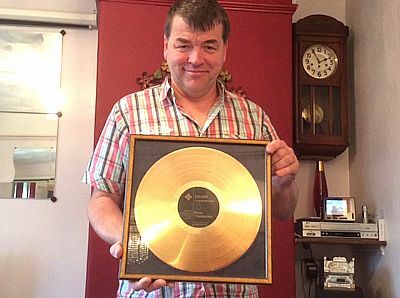 Ian proudly holds one of the twelve gold discs awarded to Klaus Wunderlich. The story behind this photograph is interesting, The disc was given to Alan Ashton by the family of Klaus Wunderlich in appreciation of his work in compiling the Klaus Wunderlich Discography. The above photograpgh was taken when Ian called to see Alan at his home in 2015. Klaus Wunderlich died suddenly in the year 1997 at the age of 66. In 1985 Ian appeared with him on stage at the October Caister Festival.